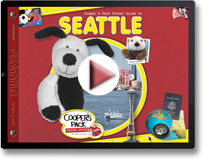 Join Cooper and his friend Elliott the Otter as they explore Seattle’s beloved attractions including the waterfront, Pike Place Market, EMP, SAM, Ride the Ducks, and Seattle Center. Finally, the friends end up at the Seattle Space Needle where Cooper is in for a special surprise! The interactive version takes you through Seattle like no other travel guide can. Hunt through the book to find Cooper’s hidden secrets, or “buried bones”. Touch the picture and see a zoomed in view with additional information and silliness. The book also includes an activity section detailing Seattle’s interesting facts, history, maps, and answers the question “Does it really rain that much in Seattle?”. By combining the rich imagery used in the print version of the books with an interactive “Where’s Waldo” type feature to see what Cooper hid, readers are guaranteed to enjoy their journey. New interactive elements include nearly 100 “buried bones”, navigation, and advanced fun fact information with additional imagery. 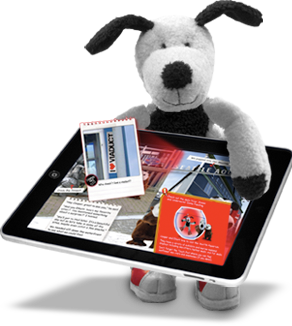 Education and entertainment for children and adults alike!